Watch for fallen trees on the right-hand anti-clockwise route, especially near the trig. This is a toughish 6 - 7 hour circular walk into the Tararuas. There are excellent views of the Tararua peaks on a clear day (which isn't very often). At the start of the route there are some small streams to cross and you will get your feet wet (it is ankle deep even in summer). Most people do the walk clockwise, but you can go round either way. There is a DOC hut (sleeps 6) about 2/3rds of the way up when going clockwise, from which it is another 30 mins to the tops. 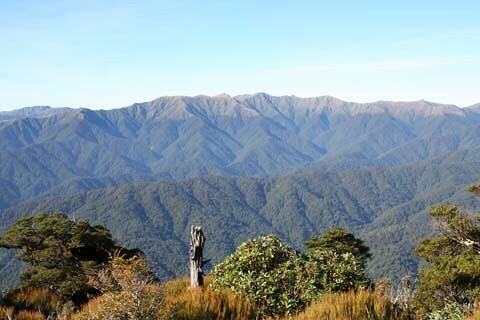 It is only at the top that you get a view of the Tararuas, otherwise you are walking in native bush. There are some short steep parts going up and down. This walk is for experienced trampers. I have recently updated the track with a more accurate GPS map. The route going clockwise from the stream has been changed and the track is now slightly less steep in places than it used to be. The muddiest spots are at the top south of the trig. Overall, the left-hand clockwise route from the stream to the hut and top is in slightly better condition than the right-hand anti-clockwise route. There are some fallen trees on the southern side of the trig and it is easy to lose the track in a couple of spots - keep your eyes on the orange triangle markers. On the whole the track is well formed, but has some boggy sections, a few fallen trees and a little cutty grass. Going clockwise, coming down from the trig, there are some fallen trees a few hundred metres down the track soon after descending into the bush line. Keep on the left (inland side) of the ridge and watch carefully for the orange triangles ahead. At Waikanae turn at the traffic lights over the railway and head inland for about 5 km to Reikorangi. Take the turn-off here to the left and go past the Reikorangi cafe/farm. This is Ngatiawa Road, and you follow this road right to the end (do not turn off on Mangaone South Road). There is a small carpark at the end of the road. There may be snow at the top in winter, so be prepared. Do not attempt to cross the Waikanae River after heavy rain.